The New International Version Celebrate Recovery Bible is geared toward those looking for hope in the face of difficult life circumstances and destructive habits. 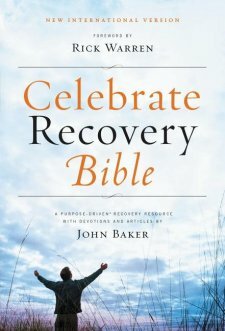 Developed by Jeff Baker and Rick Warren of Saddleback Church, the Celebrate Recovery Bible includes the text of 2011 NIV accompanied with several useful features designed to guide Christians toward true recovery in Jesus Christ. The content of the Celebrate Recovery Bible presents itself as offering encouragement and Biblical support to those who in need of some kind of recovery. Warren rightly notes in his forward that we are all sinners and in need of recovery from sin. To this end, beginning in the front matter and then scattered throughout the text itself are eight principles gleaned from the Sermon on the Mount outlining the road to recovery from the sin through the power of Jesus Christ. Together these eight principles, along with a twelve steps recovery program, are explained and applied in over 100 lessons throughout the text. Additionally, there are a month of devotional readings, stories about Christ’s power of recovery, and Biblical character studies outlining the principles and lessons which Christians may find in the words of scripture throughout this Bible, serving as excellent resources for those seeking recovery. In general terms, the content of the Celebrate Recovery Bible is both helpful and Biblically sound. Baker and Warren do a fine job exegeting the Biblical text and then noting the applicable principles within, instead of simply forcing the “self-help” frame onto the Word. That being said, occasionally the “empowerment” language feels over the top, though this is nothing new for those even somewhat familiar with Rick Warren. The biggest concern with the Celebrate Recovery Bible involves putting names on the front cover, as if this particular Bible is in need of celebrity endorsement. Rick Warren’s forward is good, but it’s a page long and hardly necessitates that his name being in bold at the top of this Bible. Experience has shown that softcover Bibles often do not withstand extended use well, and it is here that we note the biggest concern with the construction of this Bible. This is not to suggest that the construction of this Bible is cheap; on the contrary, overall the Celebrate Recovery Bible is solidly constructed and easy-to-use. Especially nice is the brown print, a welcome break from the ‘black type on white pages’ that many Bibles employ. From a historical or Biblical studies perspective the contextualization of scripture was rather lacking as the introductions and study notes where very brief, though what was included seemed adequate given the purpose of this particular Bible. The Celebrate Recovery Bible would make a great tool or gift for someone seeking recovery from a traumatic experience or attempting to escape the power of addiction. Of course, all have sinned and can learn to rely upon Christ more faithfully, and thus everyone can grow from interaction with the lessons presented here. This Bible is careful to not present itself as the “cure” for what ails us – as Warren notes in his forward, only faith in Christ and connection with His church can bring us true healing. So engage the Word, follow Christ, and grow in community – and celebrate recovery. I received this book from Zondervan and Book Look in exchange for my honest review. All opinions expressed are my own.